HelloFresh is an affordable way to have amazing recipes and delicious fresh food delivered to your door. You may well have seen their adverts online. Here’s an overview of their service from the horse’s mouth! 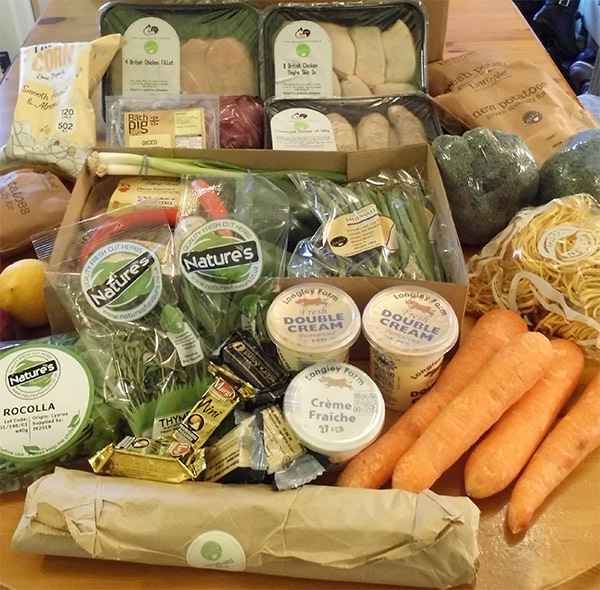 I was delighted to be given the opportunity to check out a HelloFresh Family Box. As a newcome, I wasn’t sure what to expect. I was therefore surprised when this massive box arrived. 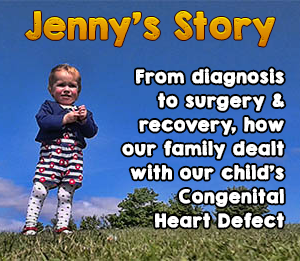 The box contained all the ingredients necessary to cook four delicious, healthy meals for a family of four to five people. There was so much food in the box that I couldn’t fit it all in one photo! The four main meals were two chicken dishes, a beef dish and a sausage and pancetta dish. HelloFresh also offer boxes for vegetarian diets and their classic selection. The box comes with the four ingredient cards giving a brilliantly simple guide of how to make the food. 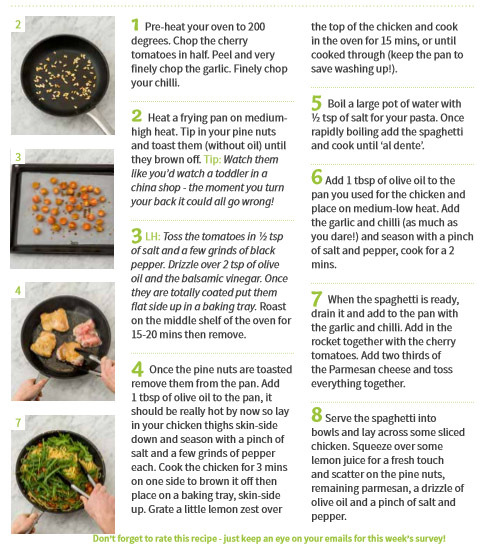 The HelloFresh website also contains an online copy of each recipe and lots of interesting info about the dish and the ingredients. There’s clearly a lot of work gone into the preparation of each dish. 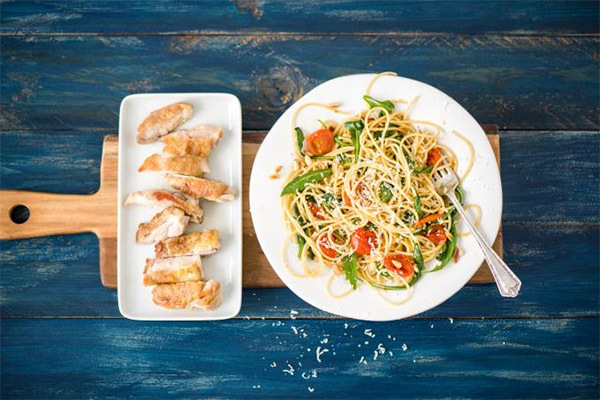 Our first family meal from the box was Roasted Cherry Tomato Spaghetti with Rocket & Citrus Chicken. The recipe called for chicken thighs, which is something I don’t think I’ve cooked before. Frying them in a little olive oil for a couple of minute left an amazing colour on them. They were then cooked in the oven, with some grated lemon zest sprinkled on top. The cherry tomatoes were halved, drizzled in olive oil & balsamic vinegar and roasted. The smell was amazing. It was remarkably simple. You boiled the spaghetti, fried up the garlic and peppers, then mixed in the tomatos, rocket, grated parmesan and some seasoning. Then it’s a case of sprinkling on pine nuts and serving. The end result blew me away. 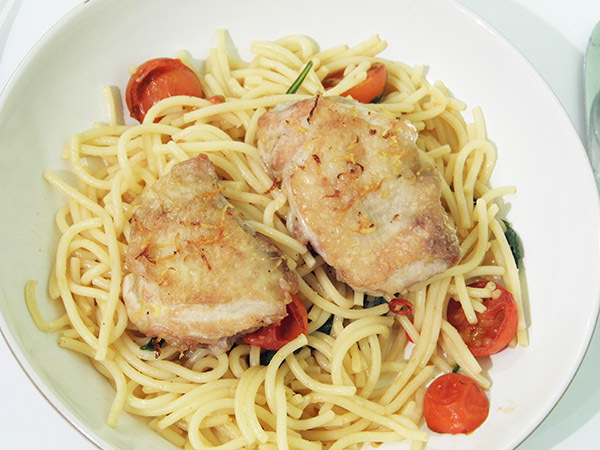 The sweetness of the cherry tomato mixed with the heat from the red peppers, the beautifully crisp and lemony chicken, the flavours from the garlic, rocket and parmeson. It was incredibly delicious. We’ve got another three meals to make just from this box. Tomorrow, I’m making Stir Fried Chinese Chilli Beef with Smithfield Steak. The other two recipes in the box are Pan Fried Chicken with New Potatoes and Tarragon Sauce and Sausages with a Broccoli and Potato Gratin served with Glazed Carrots. The quality of the food we received was top drawer. Every single item screamed freshness. The amount of food you get for your money is astounding. We could barely get the fridge door shut! I can’t recommend HelloFresh highly enough. They’ve definitely won me over! The customer service level is also through the roof. HelloFresh clearly want you to enjoy their food and the service and will bend over backwards to make sure you are satisfied. 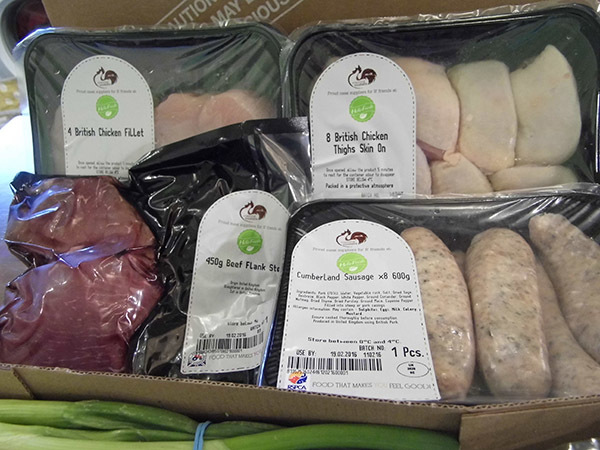 The review box we received was a family box for four to five people containing four meals which normally costs £64.00. If you enter the competition below, however, you will receive an email from HelloFresh after the closing date allowing you your first box for 50% off! Disclaimer : For this review, I was sent (as I mentioned above) a Family Food Box by HelloFresh. Those legends at HelloFresh are giving you the chance to win a similar Family Recipe Box worth £64.00, containing four meals for 4 – 5 people! All you have to do is fill in your details in the widget below, which allows you to come back every day for extra entries. Closing date 13 March 2016 at midnight. Entrants must be over 18 and live in the UK (unfortunately HelloFresh don’t deliver to islands off the coast of mainland U.K. and the Scottish Highlands). Closing date is 13 March 2016 at midnight. Winner will be chosen at random and their details passed to HelloFresh for prize fulfillment. If there is any suspicion of cheating, a new winner will be drawn. All entrants will receive an email from HelloFresh at the end of the draw giving them an opportunity to receive their first HelloFresh food box for 50% off! No cash alternative or alternative prizes. We get brochures all the time for HelloFresh, can’t believe how much lovely food you get! It looks delicious! Honestly – the phrase “generous portions” doesn’t begin to cover it. what a great idea! 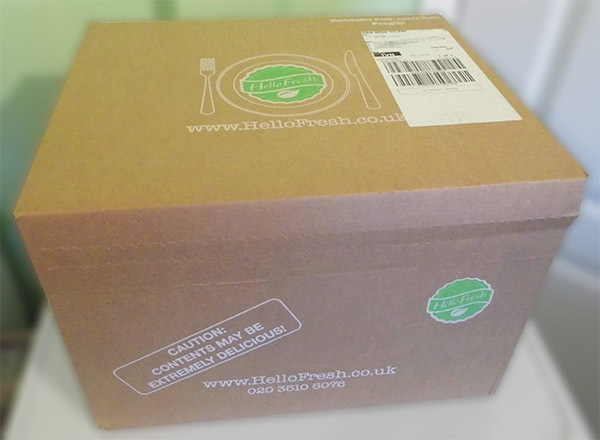 I haven’t heard of hellofresh before but that sized box would probably do us a week! if not more, there are only three of us! I will have to look into it! Have been looking at these boxes got a while and wondered whether they were worth the money. If I don’t win I will be using the code. What a fab giveaway, they will be at an event on Monday so I will look forward to talking to them! Looks like a great way of getting my kids to try something new!! Now this is what I call a food box and I love the variety of products in it. As it happens, I am loving the look of those sausages! Hello Fresh is such a great idea, all that fresh produce just looks so delicious. 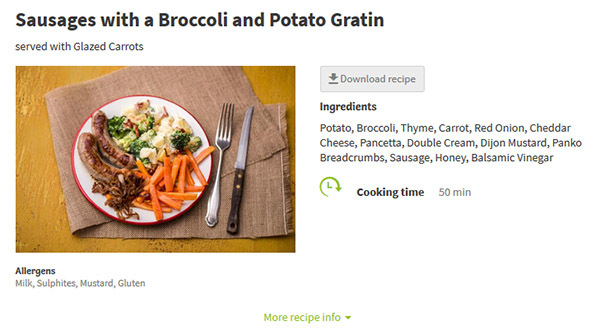 The broccoli and potato gratin would be a favourite of mine. They don’t deliver in Aberdeen, which is nowhere near the Highlands. I suspect what they mean by Highlands is “north of Dundee” or about 60% of Scotland by land mass. And what is irritating about this lot is they won’tt tell you in advance about their stellar grip of geography, they let you go all the way to the check out to knock you back.